What will the BBC look like in 2022? The BBC's already looking forward to its 100th birthday in 2022, and director general Tony Hall has given us a glimpse into the future of the world's most venerable broadcaster. Hall, speaking at the 'Where Next' event, talked about the need to keep hold of the things that work so well for the BBC, but also about the marriage between innovation and creativity and just how he believes the UK's audience will be consuming media in nine years' time. "Just as we embraced the internet, just as we created freeview and the iPlayer we are going to reinvent what we do bit by bit to serve this new audience in new ways - so what does this mean for the BBC in the future what will we look like for our 100th birthday in 2022?" asked Hall. Hall is keen not to throw the baby out with the bathwater, and he outlined the pillars that should remain in place over the next decade. "In some ways we'll look the same and we'll be the same. We'd still be the only public service that pretty much everyone chooses to use each week," he said. "We'd still be the place that everyone goes to for big events we would still be the preeminent provider of news you can trust not just locally or nationally but all over the world and of course we'd still be famous for our drama or our natural history." The need for change is clear, however, and Hall outlined the areas that will change as the BBC builds for its second century. "In other critical ways we will look quite different. The iPlayer would be the best online TV service in the world and the front door to many people to the whole world of the BBC. "Globally we'll reach more people - half a billion will be coming to our news, culture and information service. "We would be recognised the world over for what we do in music, arts, the world of ideas. We would be Britain's catalyst for creativity, helping the uk's amazing array of arts and science institutions to reach new audiences across the globe. "And we would have a two way a closer and warmer relationship with our audiences people would think not THE BBC, but MY BBC, OUR BBC and that to my mind would the be a BBC that had reinvented itself. "Still confidently informing, educating and entertaining, but in a very different way. 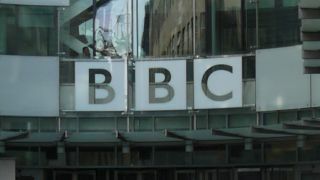 It would be a BBC worthy of its 100th birthday, a BBC to be proud of and a BBC whose best days lay ahead of it. "The key challenge is to harness our power to create to our power to innovate, and innovation has been a part of the BBC since its foundation. You have refresh to regenerate and I guess you can't be the home of Dr Who for 50 years without knowing something about regeneration." The BBC has had a tough time of late, but remains perhaps the most iconic British brand, certainly in terms of technological innovation and broadcast. Hall's vision of the future remains a plan - but he's clearly keen to put the disgrace of Savile and pay-offs behind the corporation and look to the future.